Christopher Brookes at Noon Sunday in the Hood Room. Come to our Spring Plant Sale at Furney’s Nursery in Des Moines, Washington, April 12, 2014 for an amazing selection of mums or come to one of our meetings and learn some of our techniques for growing Mums. 1. Clean up your cutting beds, Temp. controls etc- See Dec. 2013 newsletter for details. Eagle or Immunox fungicides. You should be finishing up this month. 3. Lay out your growing plans for the year ( Cultivator list). I like to break it down into 3 or 4 sections i.e. – Early English & Garden varieties. When you group them together like this you will find the start dates and stop dates to be much more cohesive as many in a group tend to work alike. 4. Now go to work and plan your stopping dates and then back to your cutting dates. 5. Start taking cuttings per your plan. Note, Most of the mums needn’t be Started in January, but a few really need an early start. 6. Refer to previous meeting notices for detail on how to take cuttings and care for them. We’re now at a crossroads in two areas: 1. Starting media & 2. Starting times/Pinch dates. -Past practice has relied primarily on starting in cutting beds, or sometimes starting directly in 2 1/2 ” cross bottom squares or variations thereof. In most cases a cutting bed with a starting media and temperature controlled heating elements such (heat pads, heat coils, other) plus overhead protection (clear Plastic or glass) and overhead light was a standard approach. -In 2013, Chris Brookes picked up on the cutting method currently used by Ray Gray of Kings Mums which uses “Earth Pots”. These come in trays of 72 starting modules. A cutting bed per se is not required, but you still need to provide a source of even temperature controlled heat , overhead protection, overhead lighting plus overhead spraying. OK so there are differences. That doesn’t mean one approach is right and the other is wrong. There’s not much difference in the comparisons so at this stage we’ll just have to wait and see ! Now let’s look at the other Quandary– Starting times and pinch dates. These are very closely intertwined and are dominant factors affecting the date when the blooms will be fully out. However the individual cultivar characteristics and local weather also play a major role in the final bloom time. Lastly, the finishing areas and late temperature controls available can have a significant effect on when the blooms would achieve their maximum potential. I used to have a green house and a closed in shed in which to finish the blooms. I could control the finishing environment quite closely. I now have moved and am finishing outside in open lexan covered areas where I can’t control the weather or the temperature. In this new environment, I can still successfully produce quality mums, but I can’t rush them along like I used to. 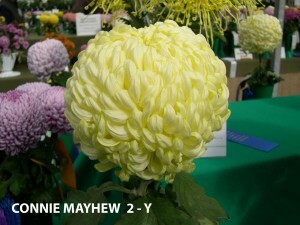 So let’s not kid ourselves, growing show quality mums to their maximum potential is an Art, not a Science. Now if you are at a loss on start dates and pinch dates, join the crowd; then work to develop dates that work for you in your environment. Keep in mind we are endeavoring to develop exceptional show quality blooms. Here’s a few thoughts that may help you sort some of it out. 1. We use the Japanese developed method of gradually moving the plants to increasingly larger pots throughout the growing season. This technique is employed to develop a much stronger root system. I continue to work on any advantage I can find to develop a much stronger root system and in time to support the planned Full blossom date. To this end I’ve changed my cutting bed medium . I now use a medium of approximately 50% Green Mountain sharp white sand and 50% Pro-Earth #2 starting mix. My results the past 2 years have been great rooted cuttings into the 2 1/2″ pots with many roots progressing upwards along the stem for nearly an inch. The White sharp sand is responsible for all the roots as the sharp sand edges penetrate the cambian layer resulting in new roots where the layer was broken. The Pro-earth #2 potting mix has a moderate amount of slow release fertilizer. Combined I’m getting strong lush cuttings, rooted and ready to transplant in 21-25 days. The Earth -Pots approach discussed earlier has potential for similar results, but the ability to produce the really strong rooted cuttings has yet to be established. I’m betting that they will prove out very well..
2. To some extent, we as a club have been starting many varieties earlier than necessary. Many of us have started early and run into the April blahs where the plants may stall out and we barely get the plants into the 9″ pots by June first. Why does it matter? Regardless of your pinch date, the plants will rarely throw a bud until it has started to get root bound. So if you need buds by the first week in August you can’t have your 9″ pot on occurring the end of June. Most of the above relates to the exhibition class mums-sections 1 thru 10. Early English classes. sections 13 through 25 are a different story entirely as they have been cultivated and developed mainly for growing in the open garden and they tend to bud more quickly and flower earlier than the other varieties. Also, their budding dates are not usually affected by the need for the roots to become root bound. Most garden varieties fall into this category also. All that having been said, It’s still necessary to start many of the big blooms early, but not in early Jan. as Stark has been accustomed to do.. If we wait until late Jan. or Feb to take the cuttings, we will generally have healthier cuttings that come along faster, but are still in manageable pot sizes when the April blahs arrive. So maybe we can keep them in dry covered and maybe slightly heated areas into May; thus avoiding the April stalls. Chris Brookes is pushing hard to move our start dates out and to some extent the pinch dates also. Another consideration is our plant sale usually held on the second Saturday of April. If you delay your starts past mid March you won’t be able to get them into the plant sale. January 2014 Newsletter – Happy New Year!! January 2014 Newsletter Happy New Year! Hoping everyone had a Merry and Joyous Christmas and Happy New Year Celebration! Looking forward to seeing you Thursday and in the New Year! NEXT MEETING OF THE ECA – is scheduled for THURSDAY JANUARY 9, 2014 at 7:00 PM at the Seattle Police Athletic Association Office (SPAA) site at 11030 East Marginal Way South, Tukwila. In line with the new meeting plan to try and make ECA meetings more interesting (i.e. Starting with Cultural and reducing time spent debating small issues), Chris Brookes will be showing and previewing a new thirty minute 2014 Power Point Chrysanthemum presentation during our January meeting. The presentation will be shown publicly for the first time at the NW Flower & Garden Show on February 9th. >>—-> Pay your dues for 2014: If you have not paid your dues, please bring a check payable to ECA or even cash and give to Treasurer Mark Ross. > “Earthpots” – Delivery at January meeting: If you ordered “Earthpots” for delivery at the January meeting, please bring either a plastic garbage sack or a trash bin liner. Putting your order into big plastic bags stops them shedding bits of peat moss all over your car and also helps retain the moisture in the pots. President John Harden called the meeting to order at 7:12 p.m. It was moved, seconded and passed to accept minutes from the October 10th. The treasurer reported a balance in our account of $3,421.00. Our major expenses for the month were related to the show and the banquet. Report filed with the minutes. Moved/seconded/passed to accept the treasurer’s report. •	President John opened this section of the meeting by presenting 2 bottles of champagne for the best blooms at the banquet. The champagne went to Ron Elliot and Sydney Ogilvie. There was a lot of interest in Sydney’s bloom, “Goldfield.” She had purchased it at Kings. •	Everyone enjoyed the banquet and declared it one of our best. •	The Japanese show elicited little interest from our club. We had 3 outside tables and the weather was brisk! John will send a report and pictures to Steve for the website. •	Steve requested pictures from the banquet, too. •	Steve reported 178,000 hits on the website since October. •	Newsletter: Steve Backstrom. Mailing of newsletters that don’t go by e-mail will be done by Becky Cox. Moved/seconded/passed that the slate be approved. •	Chris Brookes expressed concern about how we are following up on new members. He recommended that we add membership retention to our monthly agenda. •	Chris will be presenting a program at the NW Flower and Garden Show, Feb 6-9th. •	Chris sees the show as an ideal time to encourage people to join the club. Richard B. agreed to assist Chris at the show to push membership. o	Suggestion was made that we had too much business and not enough plant information. o	“Nuts and bolts” decisions for the club should be left to the Board of Trustees. o	Chris wants membership to be an ongoing agenda item. •	Moved/seconded/passed that the Plant sale will be April 12th contingent on Furney’s approval. Note to Board of Trustees: Pres. John announced a board of trustees meeting on Jan 18, 9:30 am at Wesley Gardens Conference Room. o	Chris will order them in January. Give order to him ASAP. o	Root balls seemed to be very good and developed quickly. o	Some problems placing the cutting so the netting didn’t show at the top. o	Some heated to 65 degrees with lights and covered with plastic. o	It was suggested that cuttings should be misted until roots start forming. •	For rooting, “Dip and Grow” is popular. •	Cutting dates tried by Chris B.
o	Jan:	If you want to stop twice. o	Some cuttings taken as late as April do very well. o	Analysis of M&R mix shows a good balance. o	Some have switched to Pro Earth 2. >And last, but certainly not least is our treasured to do list – updated January 2,d by Don Stark…..if all you do is follow these suggestions, you will have awesome mums – just ask Gary Budzeak and Kenji Terao our 2012 & 2013 “Best Novice” growers.